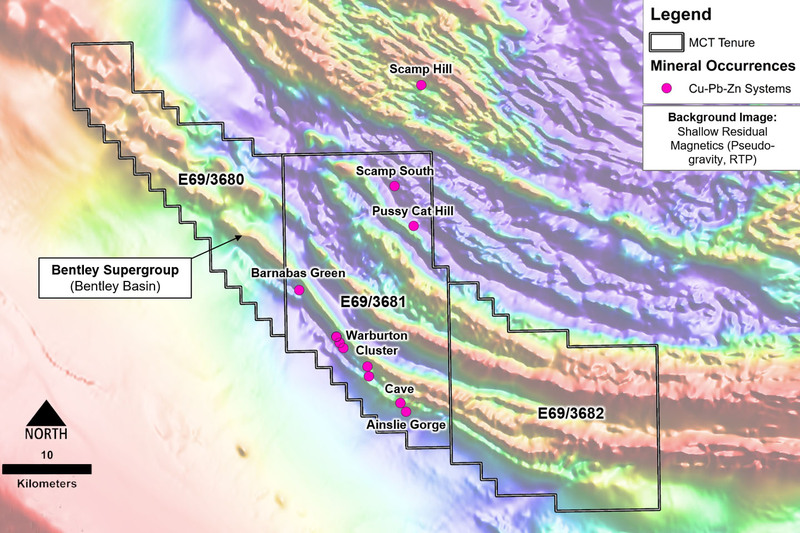 The exploration licence applications that make up the top priority Warburton project area. ASX listed Metalicity is stepping up its drive to become a significant player in the emerging Paterson copper-nickel-gold province of the Pilbara region in WA, with its application for seven new exploration licences in three separate project areas. These exploration licence applications cover a total of about 3000 square kilometres. The Warburton project is the top target based on the company’s prospectivity analysis of the entire Paterson province. This target is a large sediment-hosted or sedimentary-exhalative copper horizon spanning about 80km within the Bentley sub group. Previous exploration by WMC from 1966 to 1971 identified about 200 copper mineral occurrences and geochemically anomalous soils over significant strike lengths. Since then, subsequent operators have only conducted interpretative work with the exception of Rubicon Resources, who carried out a range of exploration work including drilling from 2008 to 2012. The other project areas are Paterson South and Pandora. Paterson South has several strong discrete magnetic anomalies coincident with basement highs and gravity ridges that are analogous to Greatland Gold’s Havieron prospect, where the UK-listed made a stunning intersection of 275 metres grading 4.77 grams per tonne gold and 0.61% copper. Pandora is a large cluster of magnetic highs on the northern side of a major crustal-scale gravity ridge with known local nickel-copper-gold and platinum group element mineralisation. Notably, drilling by Cassini Resources in 2013 noted highly anomalous, but only sub-economic copper and nickel results. Metalicity stated its belief that the work carried out by Cassini was not optimised for the ore target styles it is seeking and that a more relevant work program needs to be adopted. The new project areas more than doubles the company’s Paterson exploration licence applications that cover the northern Mandora and southern Desert Queen projects. Desert Queen covers an area of 679 square kilometres and is located 20km along strike from exploration conducted by Rio Tinto, while Mandora covers a total area of 1,487 square kilometres and adjoins tenements held by Rio Tinto and Fortescue Metals.